Would it be creepy if you just smiled in response to this question? 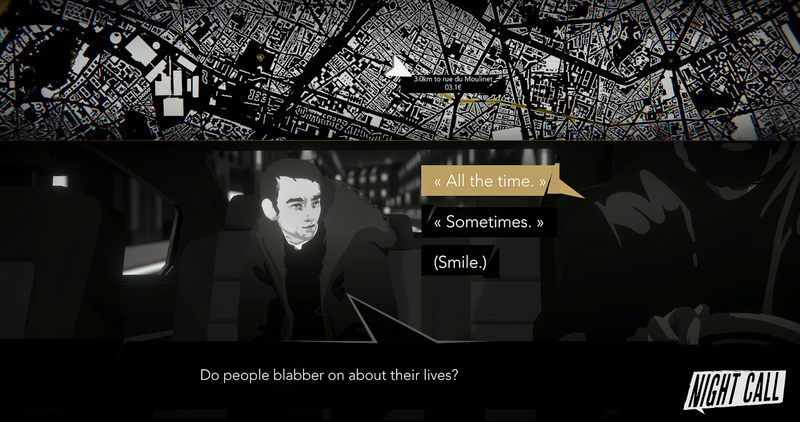 Night Call is a "non-linear narrative game" by French indie developer, Monkey Moon where you play the role of a Parisian taxi driver. What makes the game interesting though is that you're tasked by the police to find a serial killer and you do so by doing what taxi drivers do best: chatting with their passengers. The tricky part is, you only have a limited amount of time and I suspect you don't want to make it feel like an interrogation (even though in reality, it is). You also have to juggle the competing demands of making money and solving the case since angry passengers are probably not something you'd want if you value your livelihood. The game seems to be a promising one as I love murder mystery games and I definitely dig the film noir look. The fact that there are multiple endings with different killers each time you play is also something worth mentioning, although hopefully this doesn't dilute the experience too much (this tends to be the case when you introduce more random elements, procedural generation or too many branching paths). Anyway, guess we'll find out in early 2019!